Herbert Weston Phillips was born in Long Bennington in 1924, the son of Herbert and Mary Cordon Phillips. In WW2 he joined the RAF as an air gunner and served on 158 Sqn at RAF Lissett, near Driffield, Yorkshire. He was promoted to Flight Sergeant and on the night of 22 Mar 1944 he was the mid upper gunner on a Halifax MkIII on a raid on Frankfurt, taking off from Lissett at 7pm. At about 11.15pm local time, on their way home, they were shot down over Belgium. All the crew were killed, apart from the co-pilot who was injured and captured. The dead were buried at Gosselies near Charleroi on 25th Mar. Bert was 19. Theirs was one of 7 Halifax aircraft shot down that night. 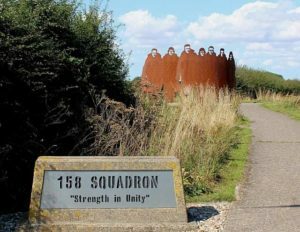 158 Sqn had the highest casualties in Bomber Command and their aircraft (HX342) was the 7th to carry the Sqn marking NP-F (for Freddie) in 12 months. So when a replacement aircraft was given the same letter there was some concern that NP-F was jinxed. 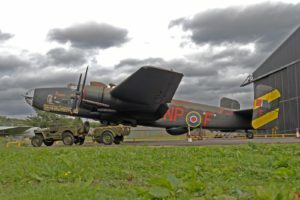 However, the replacement Halifax christened ‘Friday the 13th’ became famous for completing 128 operations and the Yorkshire Air Museum have recently built a complete reconstruction of ‘Friday the 13th’.